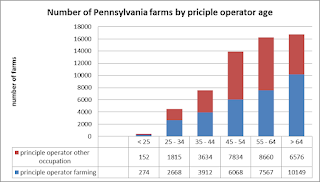 Home agriculture business decision-making farm demographics new farmers retiring farmers Does the average age of Pennsylvania farmers threaten our agricultural industry? Does the average age of Pennsylvania farmers threaten our agricultural industry? We see observations noting concern over the escalating average age of our farmers. For example; the average age of a Pennsylvania farmer was 51.6 years in 1940 and in the most recent ag census of 2012 the average age is reported at 56.1. This article takes a closer look at data around average farmer age with an eye to a better understanding of how average age may impact farming and the food we enjoy. We find the 2012 Census of Ag reports Pennsylvania has 59,309 farms. The first table below shows the age distribution of the operators of these farms according to Ag Census categories. Using the categories provided by USDA in this table we can see that the largest number of farmers are over 64. This proportion is slightly over 28% of the total. This causes concern because many feel the age at which one should retire from productive work is 65. One piece of information to note also in the above table is that 40% of our over 64 years of age farmers list their principle occupation as something other than farming. If we include all ages of principal farm operators we find 48% of Pennsylvania farmers have a principle occupation other than farming. Exploring further using the data in the table below from this same USDA Ag Census we find that the 28% of farmers over 64 have 29% of the farm acreage and 22% of the farm income in Pennsylvania. While the farmers between the ages of 35 and 54 have 36% of our farms with 35% of the acreage and 45% of the farm income. In summary, while the number of farms controlled by “retirement age” farmers is relatively large the majority of farm acreage and farm income belongs to a lower age range of farmers. 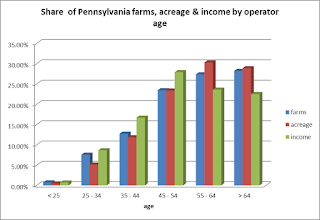 Additionally, nearly one-half of Pennsylvania farmers are 54 years old or younger. We may also remember that the wider U.S. labor force also has an increasing average age compared to 1940. The 2013 research of C. Zulauf, University of Illinois tells us the average age of farmers mirrors the average age of the broader work force. Further checking Bureau of Labor and Small Business Administration statistics we find the average age of a farmer compares closely to the average age of the owner of any small business. This article adapts information first presented by Kuethe, T. “We may not have an aging farmer problem after all”, farmdoc (5):27 and USDA, 2012 Ag Census.